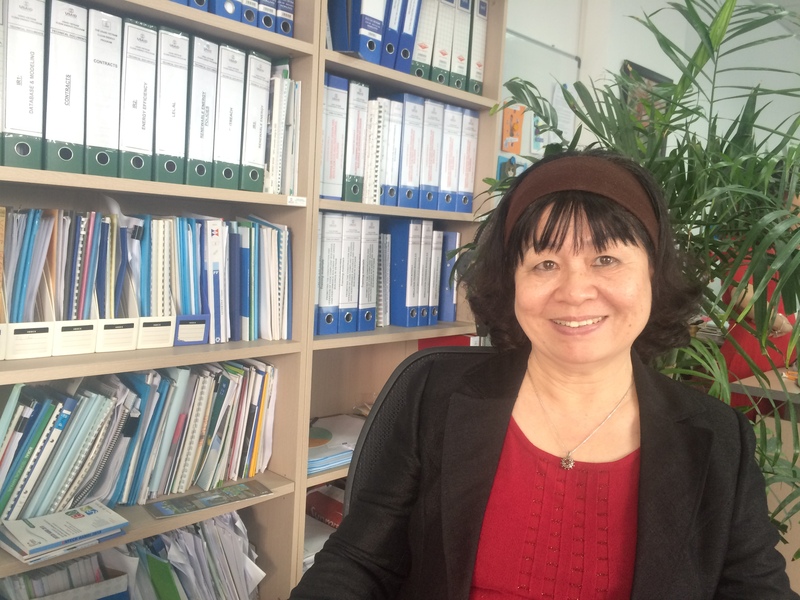 Throughout her long career in Vietnam’s construction sector, Nguyen Thi Minh Phuong has worked tirelessly on initiatives that promote sustainable development. Ms. Nguyen started her first job in 1975 as a researcher on construction glass under the Ministry of Construction. Part of her work was to look at recycling glass to make stable and low-cost building materials. She then moved to the ministry’s International Cooperation Department, being involved in calling for and implementing a number of environment-related projects for nearly 14 years. Currently, she remains an active player in promoting green and sustainable buildings in the country, though she retired from government service in 2007. She is collaborating directly with the USAID Vietnam Clean Energy Program, which focuses on promoting energy efficiency in the country’s building sector. “Environmental protection is both my concern and interest. I want to join hands with the program even though my contribution is minimal,” she said. Under the program, Ms. Nguyen, with a group of construction experts, is developing a database of construction materials for green and energy efficient buildings. This database will help building professionals gain awareness of existing green materials in the country, and hopefully such awareness could lead to a wider use these materials so that future — or even existing — buildings may be resource-efficient as well as naturally pleasant and comfortable for the occupants. Ms. Nguyen is also contributing to the development of a Green Growth Action Plan for the construction sector, a task that she is very enthusiastic about. “Each job has its difficulties and it’s important to be proactive at your job. When I’m assigned to do a new task, I learn how to complete it well, especially if it’s something I’m passionate about and will make Vietnam a better place,” she said. Ms. Nguyen’s life itself is a demonstration of one person’s persistent and untiring efforts to better herself in order to achieve her goals. After six years of studying for bachelor’s and master’s degrees in silicate chemistry at the Russian Federation of the former Soviet Union, she returned to Vietnam in 1975 and began working as a researcher at the Ministry of Construction’s Building Materials Institute, where she stayed for 18 years. 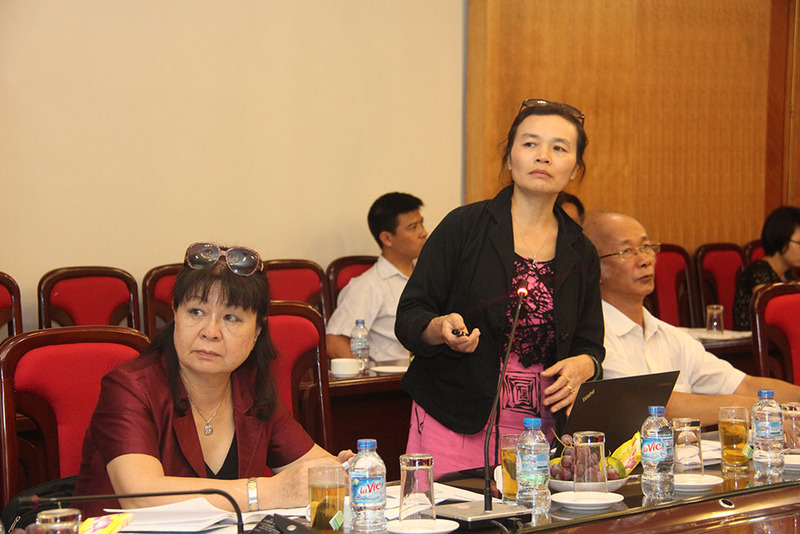 Ms. Nguyen (first from left) participating in a stakeholder session on drafting the Green Growth Action Plan for the Vietnam Ministry of Construction under the USAID Vietnam Clean Energy Program. “The work at the institute was challenging. We often stood on a ladder on top of a furnace to stir molten glass to remove its bubbles. The furnace was about three meters high and the temperature was more than 1,000 degrees Celsius. Despite the difficulties, our team managed to fulfill the work. We succeeded in producing glass insulation which has been commonly used in Vietnam,” she recalled. In 1990, to adapt to changing times, she began studying English, which by then had emerged a popular second language in Vietnam, following the country’s implementation of free-market reforms – known as Doi moi (Renovation). Soon after, her new language enabled her to move to the Ministry’s International Cooperation Department, where she coordinated donor-funded projects in construction and the environment. She was then awarded a one-year English scholarship in Australia. “While studying abroad, I learned different and creative ways of thinking. It was a great experience,” she recalled. Ms. Nguyen used her new skills to better design and implement projects focusing on the environment. Her hard work paid off when she was promoted to be deputy director general of the department in 2001, a position she held until her retirement. Ms. Nguyen now serves as the vice president and external relations manager at the Vietnam Association for Building Materials, a professional organization collaborating with the USAID Vietnam Clean Energy Program on promoting green and sustainable buildings.